Erlebnisse is still in the baby stages as far as book blogging goes. Part of my goals for this year is to really dedicate my time to all three of my blogs, but I’ve been really actively looking for new ways to spice up this blog in particular. So when I discovered, through the other book bloggers that I follow, that there is a weekly event hosted by Breaking the Spine called “Waiting on Wednesday” that highlights books everyone is eagerly awaiting, I was stoked to join in. 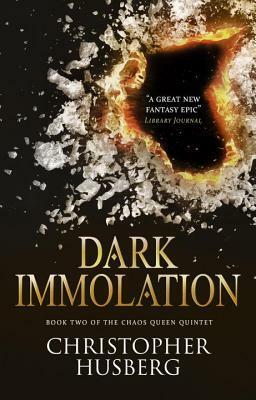 And for the first time doing this, I can’t think of a better book to salivate over than Christopher Husberg’s Dark Immolation, the second installment in the Chaos Queen Quintet, to be awarded to the public June 20th of this year from Titan Books. In case you were wondering, that’s five months, fifteen days, two hours, eleven minutes and fifty-five seconds from now. If you’re still wondering, that’s five months, fifteen days, two hours, eleven minutes and thirty seconds too long. Dark Immolation follows Duskfall, which I truly raved about here. I claimed it was the best new book of 2016 that I read and that claim still stands as we enter the new year. Ever since I read that book, I have been low-key stalking following the author, because he’s seriously shot up the ranks as one of my favorites (plus, I’m waiting for him to hit that spot in author fame where he has the desire to be a mentor and then I’ll be ready to fight for that spot, Hunger Games style, if necessary, because the way he interweaves backstory is flawless and I want to learn). Not only did I love his first book, but I also really enjoy his blog and the honesty he uses when describing his publishing journey. Anyway, if you’ve read Duskfall, then you should check out the blurb for Dark immolation, quoted below. If you haven’t read Duskfall, why in Canta’s name are you still reading this post? Go and purchase Duskfall IMMEDIATELY. And then let me know what you think after you’ve read it. I need people to discuss with me. I have opinions that need voicing. There are rumours in Ashta – a new religion is rising, and Cinzia, one-time Cantic priestess, has escaped the Holy Crucible. Fleeing from Navone, Cinzia travels with Knot, a man of many parts, and Astrid, the child-like vampire. They are gathering followers, but the murderous Nazaniin are still on their trail. Meanwhile, Winter is losing her grip on sanity, grappling with immense powers beyond her understanding. Where she goes, chaos and death follow. Did that get your heart thumping like mine? I sure hope so. Come on June 20th, hurry up.